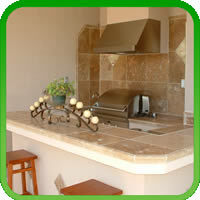 The location for your outdoor kitchen design is a very important decision and many homes offer several choices. Some will be under your existing covered lanai or on an open patio. We have found that most clients would prefer to have their kitchen located under a roof structure, protecting them from the harsh conditions of the sun and allowing them to use their grill during rain and other bad weather. This is a great idea if your space will accommodate this design and dramatically increases its usability. This does however create unique challenges for properly venting your typical built-in grill. Your NOKFA design-builders are trained in dealing with such issues and can walk you thru the options and concerns in properly venting your outdoor kitchen. The most important aspect to understand is the type of hood system required and the proper installation for a successful project. The outdoor hood must have a 1000 to 1200 cfm motor to allow for proper ventilation to quickly remove as much smoke as possible. Opening the hood of your grill will immediately create a burst of smoke and it is important that your hood system be capable of drawing this smoke up, not allowing it to linger in the lanai. It’s important to understand that no system is 100% effective but choosing a good, quality system and having it properly installed will result in a more pleasant grilling experience creating the desired atmosphere for entertaining your family and friends. If you have any questions regarding hood vent systems for your outdoor kitchen project, please contact NOKFA for a design- builder in your area.